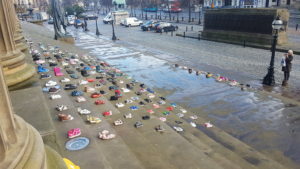 More than 200 pairs of children’s shoes were placed on the steps of St George’s Hall today to raise awareness for young people losing their lives due to suicide. The Papyrus charity and Radio City came together to kick-start Children’s Mental Health Awareness Week by leaving shoes at the Liverpool landmark. This was also to mark the station’s Mental Health Monday feature’s 100th episode. Papyrus worker, Lisa Roxby, told JMU Journalism: “The school shoes that we have on St George’s steps today represent the 226 schoolchildren’s lives which were lost to suicide in 2017. Onlookers were clearly intrigued by the display, with several people stopping to enquire what it means. Ms Roxby added: “We have had people asking what the significance of the shoes are and being shocked in terms of how many young people are lost every year. “There are over 200 schoolchildren that die every year by suicide and over 1,600 die every year under the age of 35, so it is something we really need to talk more about, more openly and safely and encourage people to reach out for support.